Surmang Khenpo from Surmang returned to Halifax in January for an extended three-week visit, working with us primarily on texts from the Vidyadhara’s collected writings from Tibet (sungbum). Khenpo’s facility with English, combined with his deep knowledge of dharma and familiarity with the traditions of Surmang, provide us with an exceptional resource. He is also a lot of fun and filled with a savvy humor. We worked on a very important Avalokiteshvara terma, a Krodhikali (Tröma Nagmo) sadhana that incorporates a lengthy chö practice and phowa, and a supplication to Surmang tertön Rolpe Dorje, among other texts. 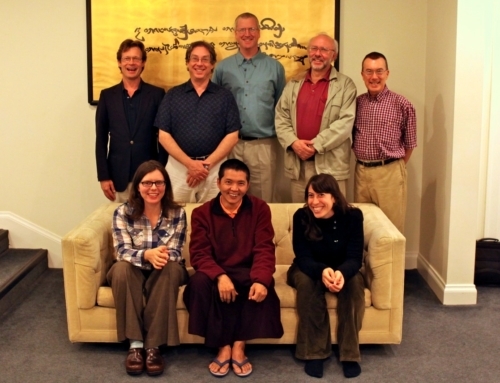 Mark Seibold, committee member from Connecticut, joined us for some of this time, during which Khenpo gave a weekend program on the Trungpa lineage, including a short exposition from a famous mahamudra text by the fourth Trungpa, Künga Namgyal. 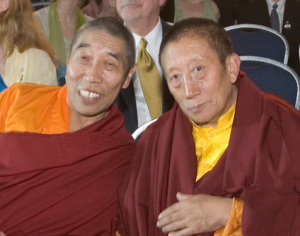 Sönam Tobgyal Rinpoche and Lama Pejal. The promise of a June wedding brought a host of Tibetan visitors and lamas, and while they were all here to join in the festivities, we did our best to meet with a number of them. We had a wonderful reunion with Sönam Tobgyal Rinpoche from Toronto, with whom we have worked many times. We met briefly with Lama Pejal, the husband of Lady Könchok. 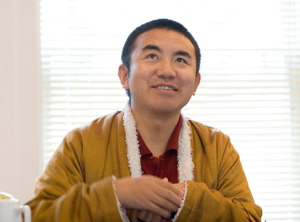 We had several sessions with Jigme Rinpoche and one with his father, Namkha Drimed Rinpoche, working on the Gesar supplication by Trungpa Rinpoche. With the assistance of Jigme Rinpoche, the committee also prepared materials for the various empowerments and ceremonies connected with the wedding. 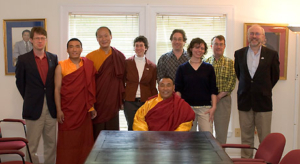 Karma Senge Rinpoche with Lama Ngodup & the Committee. 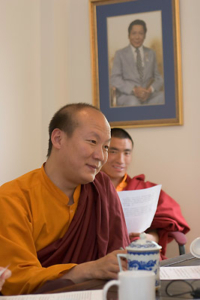 Knowing that Karma Senge Rinpoche would be coming to the wedding, we made a special request for him to remain in Halifax for several weeks altogether. Surmang Khenpo also returned, but was only able to stay for the wedding events. Still, we were able to meet with him a number of times during these few days to conclude what we had begun in the winter. Khenpo returned home to Surmang quickly, as he is the main supervisor for the Shedra building project, and the construction season was well underway. During Karma Senge Rinpoche’s first visit in 2003, we learned about a very profound Avalokiteshvara terma discovered by Trungpa Rinpoche in the Crystal Cave of Vajrasattva at Kyere Shelkar, the mountain where the Vidyadhara discovered many terma. The Vidyadhara received this terma directly from Ekajati, and Karma Senge Rinpoche expressed his reluctance to teach this without obtaining her permission. Last year, during his second visit to the West, when he offered a reading transmission (lung) on this text in Boulder, we quickly prepared a draft translation in hopes of having him teach us this in Halifax. 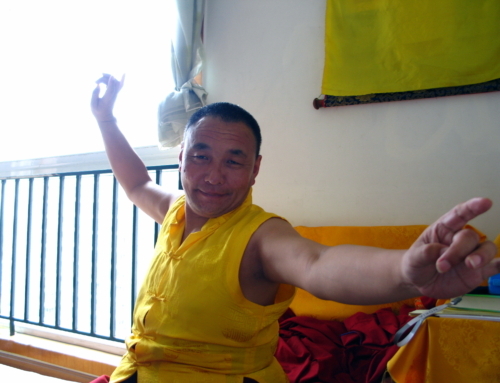 When Karma Senge Rinpoche conferred the lung in Halifax, we were prepared to receive his teachings on this, but then he explained that first we needed to receive the abhisheka—little had we known that such a text and ritual for this sadhana even existed. So for this year’s visit, we requested Karma Senge Rinpoche to confer this abhisheka after the wedding to a small group of people, primarily to enable the translators to better understand and complete the translation. The Sakyong thought it would be best for this empowerment and teachings on it to be the main focus of Karma Senge Rinpoche’s next visit to a number of our centers, hopefully in the coming year. We plan to have completed our translation for this, and perhaps even compiled a practice commentary that could be distributed at that time. We were very fortunate to be joined in our work with Karma Senge Rinpoche by Lama Ngodup Dorji from Bhutan, who had planned to journey here to attend the Sakyong’s wedding. 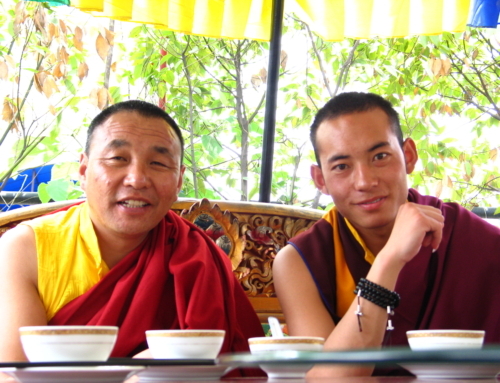 Hearing of Lama Ngodup’s intention, we requested him to remain in town to work with us and serve as Rinpoche’s interpreter, having previously been Khenpo Namdrol’s translator for many years at Penor Rinpoche’s monastery. In fact, we had worked closely with Lama Ngodup preparing for the Sakyong enthronement ceremonies in 1995. He was a terrific addition to our group. His knowledge and experience, combined with his fluency in English, were invaluable. We worked together with them on quite a number of texts by the Vidyadhara, including everything we had previously prepared with Surmang Khenpo, the feast song given above, as well as several short liturgies: two Ekajati texts, a Manjushri terma, a magnetizing practice of red Chakrasamvara, and short sadhanas of Dechen Öbar, Guru Trakpo, Chemchok Heruka, and Vajrakilaya. Next comes the process of reviewing our work, editing, and polishing the translations. Stay tuned for more. Lama Ngodup remained in town for a while longer, waiting for his US visa, and we were able to review the Vidyadhara’s Gesar text with him during this time. We hope that he will return and join us again. As for other projects, we completed a new edition of the Werma Sadhana Manual,including complete instructions on the feast practice. An addendum summarizing the amendments is available on our website. For the Rigden abhishekas at Dechen Chöling and Karme Chöling, we prepared a booklet summarizing the empowerments and containing all the liturgies to be used. This is now available for anyone who attended the two earlier abhishekas at Shambhala Mountain Center and Halifax. We have finally completed and published our new edition of the Vidyadhara’s translation of The Sadhana of Mahamudra. As always, we prepared transcripts of Khenpo Tsültrim Gyamtso Rinpoche’s teachings from the previous summer at Karmê Chöling, including talks by many of the other teachers at the program, entitled Pramana, Tantra, and the Middle Way (KCL 2005). We also prepared a separate volume of Khenpo Rinpoche’s songs and teachings, The Melody of Dharmata, given at KCL, Dorje Denma Ling, and Holy Island, Scotland, in 2005. This latter volume is available for all tantrikas, and no special permission is required. Larry taught the sadhana practice module (Vajrayogini, Chakrasamvara, and Vajrakilaya) in the Great Stupa during the Sakyong’s first Dzokchen Retreat at SMC this past summer. He plans to lead a group journeying to Kham, Eastern Tibet, next summer, visiting Surmang and many of the home monasteries with which we have connections. Scott taught on chittamatra and the Uttaratantra at Nitartha Institute this summer. He continues to lead a weekly sadhaka class with Andy Karr and an intermediate Tibetan class in Halifax. Larry and Scott, and a number of other committee members, will make presentations at an inaugural conference on the works of Chögyam Trungpa Rinpoche:Spoken Words, Written Words, Beyond Words, held in October 2006 at Naropa University. Mark will lead fire offering programs at Dorje Denma Ling this fall and next spring. He continues to teach Vajrayogini classes in Halifax. Tingdzin will instruct three-year retreatants (Group E) at Sopa Chöling this fall, which includes a number of sadhakas joining the retreat for the first time to practice Vajrayogini and Chakrasamvara intensively. Jessie taught weekly introductory Tibetan classes during the year, and plans to continue this fall. The Translation Committee has been creating electronic files for many of the Tibetan texts included in the Vidyadhara’s sungbum (the collection of his terma and compositions from Tibet). 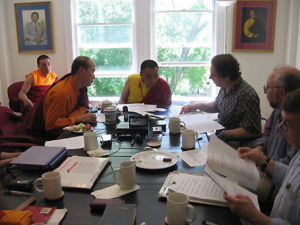 During his last visit, Karma Senge Rinpoche was eager to make editorial corrections to many of these documents, and we have entered many of those corrections. Karma Senge Rinpoche will complete the corrections to the remaining texts, as we continue to enter the additional texts that were not a part of the first collection we received. Once all the corrections have been made and the collection has been proofread a number of times, we plan to publish the entire sungbum in Tibetan. This will be of great benefit to readers of Tibetan, as well as translators bringing these teachings into Western languages. The Translation Committee has a total of 318 cassette tapes (over 400 hours) of translation meetings with the Vidyadhara, dating from 1978 to 1986. The meetings cover texts such as the Vajradhatu daily chants, the sadhanas of Vajrayogini and Chakrasamvara, the Werma Sadhana, the Shambhala terma, The Rain of Wisdom, and The Life of Marpa. The tapes are currently stored for safety at the Shambhala Archives. For several years, we have wanted to preserve these precious archival tapes in a more stable format. Now, with digitizing equipment and assistance from the Shambhala Archives, we are in the process of creating digital audio files for all of these tapes. The digital files will be preserved on the computer system at the Archives. Eventually, sets of CDs will be created so these recordings can be easily accessed.